The East Asian Youth Championships in Shanghai, China from 1-10 August and East Asian Junior Championships in Jeongson, South Korea from 1-9 August are being held concurrently. I wrote about what I felt was a possible saturation thanks to too many of the same targeting much the same audience in an earlier post: "Too Many International Youth Championships" http://www.thefidetrainer.com/2018/08/too-many-international-youth.html and from the participation numbers which has never really been high even in the past, it seems I am right! 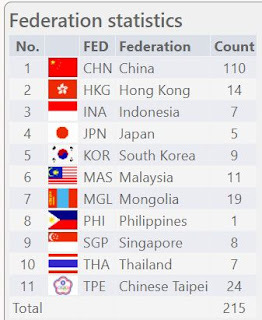 Shanghai with categories from U-8 to U-18 seems to be having only 215 participants while Jeongson with just the category for U-20 has 22 participants. One problem with insufficient players in a particular category means that it no longer qualifies for direct titles and norms are impossible but in some cases it is not even possible to have a meaningful competition. As a result, the organisers will then combine sections and while this is allowed, I have always had a problem understanding situations where a player can get a championship when playing many who not in his or her age-group. 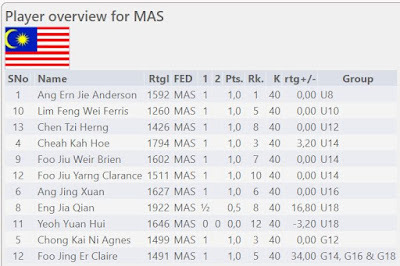 While much too many in Shanghai are from China, Malaysia is still well represented, mostly by the usual suspects.